DARTMOUTH, Mass. 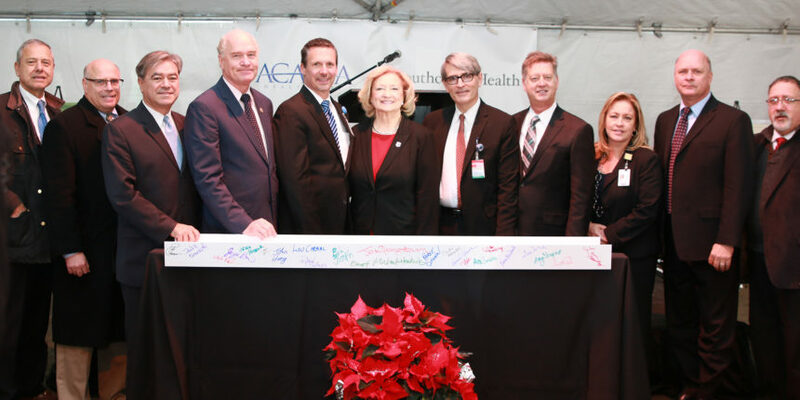 – Acadia Healthcare and Southcoast® Health today held a topping-off ceremony to signal the completion of steel work on the $30 million behavioral health hospital at 581 Faunce Corner Road in Dartmouth. The topping-off ceremony marks the placement of the last steel beam into the new structure, and is said to stand as a symbol of luck and good fortune for all future occupants. “This hospital will be measured by how well we are able to build a community of care that will engage our behavioral health professionals and patients alike in a compassionate, healing atmosphere that offers the latest in safe, proven therapies,” said Bill Parsons, CEO of the new facility. The 120-bed inpatient behavioral health hospital is being built by Acadia in partnership with Southcoast Health. The two organizations are in the process of finalizing a joint venture agreement for operation of the facility. “It is a shared mission of Southcoast Health and our dedicated local community providers to address the behavioral health challenges that face our region. Challenges that, many times, are discovered in our ERs and correctional facilities or that surface on the streets of our communities. I dare say there is no need greater in our state and, right here, on the South Coast, than the need for quality behavioral health treatment,” said Keith A. Hovan, President & CEO of Southcoast Health. In addition to this project, Southcoast Health and Acadia will continue to build upon the work already being done with local behavioral health organizations in Southeastern Massachusetts. In the South Coast, there are currently four healthcare facilities with a total of 92 inpatient behavioral health beds. The new behavioral health hospital will more than double the area’s total capacity. These capabilities will allow patients in the region to seek treatment close to home rather than travel outside the community.